This boat is in good condition. It is 20 years old, so there is wear and tear on the cockpit bolsters, storage, and the gelcoat could use some polish, but otherwise it seems in good shape. The cabin interior is in very good condition and it comes complete with a porta potty. This boat is ready for a day of fishing, are you? Stock #164777 175 Johnson Saltwater series Sleeps 2 - walk around Cuddy Cabin Trailer - Aluminum W/brand new tires and new galvanized wheels. 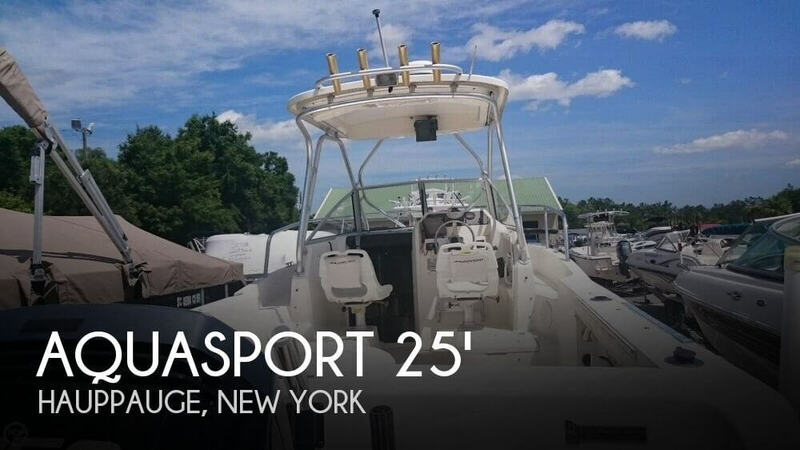 If you are in the market for a walkaround, look no further than this 1998 Aquasport 215 Explorer, priced right at $15,000 (offers encouraged). 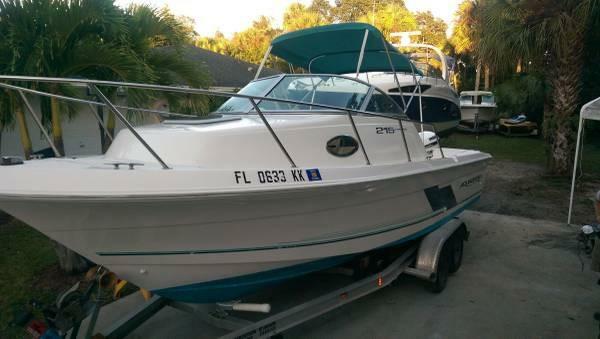 This boat is located in Palm Bay, Florida and is in good condition. She is also equipped with a Johnson engine. Reason for selling is no longer using. This 2002 Aquasport 250 Explorer appears to be in average condition for the year. 2002 Single Yamaha Series 2 Engine with 600 hours. Per the Seller, the engine runs great. All service up to date. This boat has an incredible amount of room for its size; Large cockpit and helm deck area. Gunwale sides are easy to walk around to bow. The cabin has lots of storage space and room for gear and crew. 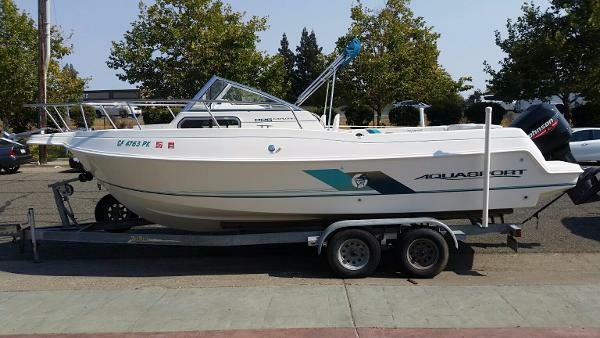 Stock #121916 2002 AQUASPORT 250 EXPLORER * 2 STROKE YAMAHA * TRAILER INCLUDED If you are in the market for a walkaround, look no further than this 2002 Aquasport 250 Explorer, just reduced to $21,900 (offers encouraged). 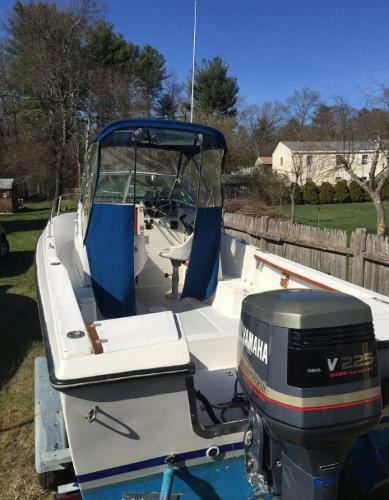 This boat is located in Hauppauge, New York and is in good condition. She is also equipped with a Yamaha engine that has 600 hours. Reason for selling is just to sell and upgrade. 1999 Aquasport 245 Explorer, On The Florida / Alabama Gulf Coast We Make Boating Fun! !1999 Aquasport 245 EXPLORER TWIN Johnson 150 2 StrokesInstalled options* ALUMINUM TRAILER WITH SPARE TIRE* ANCHOR WINDLASS* COBIA TOWER* COCKPIT ENCLOSURE* DUAL BATTERY SWITCH* HUMMINGBIRD 998 GPS/FISH* SEASTAR STEERING* STAINLESS STEEL PROPS* TRIM TABSHarbor View Marine is proud to offer this amazing example of a walk around, well maintained, always dry stored here at our facility and serviced at our facility since it was purchased new! 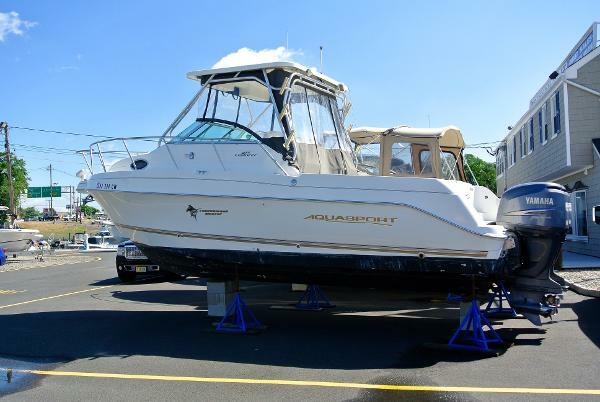 2004 Aquasport 275 Explorer A well appointed walk around cuddy with reliable twin 225hp Yamaha four stokes with only 160 hours! Equipped to fish with a RAYMARINE ELECTRONICS PACKAGE INCLUDING RADAR. 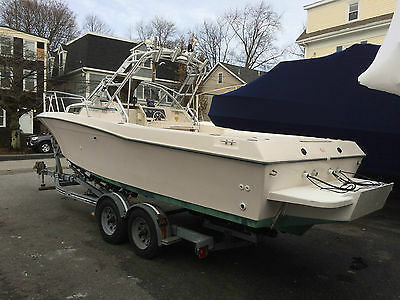 At our Brick N.J. location and ready for your inspection.HARDTOP W/ ENCLOSUREBAITWELLIN-DECK FISHBOXESDOCKSIDE AC/HEATLARGE COCKPIT Contact us for further details. 1996 Aquasport 215 Explorer 1996 Aquasport 215 explorer walk around cuddy. Turn key boat. It runs great with 150 hp evinrude, stainless prop and hydraulic steering. All new interior cushions. Stereo has audio inputs for phone hook up. Includes trailer. SHOWN BY APPOINTMENT ONLY! Located in Jupiter, Florida Turn an all-day excursion into an all-day exclusion of stress and civilization in the Aquasport 215 Explorer. This bundle of beauty and adventure will take boaters where other boats fear to tread - and where unsuspecting fish flourish. At the end of the day, retire down below into the large, lockable cabin with its comfortable V-berth. 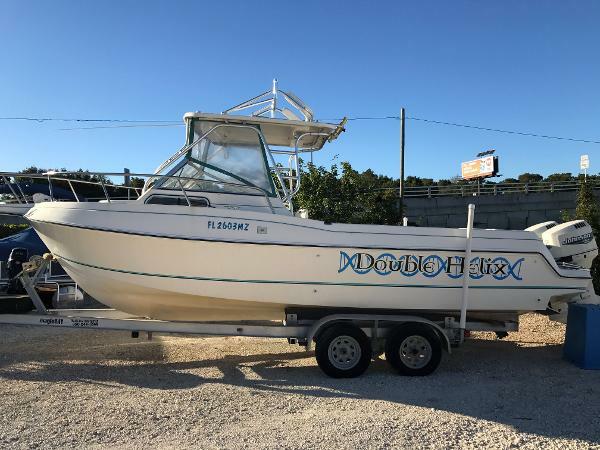 2004 Aquasport 275 Explorer Price just reduced $3000 on 12/4/15Super Clean, Lift Kept, 4 Strokes, Ready to Fish!275 Explorer Aqua Sport 2004Yamaha 200 Four Strokes w/ 582 HoursShore PowerA/C w/ Reverse Cycle HeatFull CabinGalley w/ CooktopStand Up HeadIf you are in the market for a super clean, well maintained walk around with Four Strokes, look no further, this is a must see! 1999 Aquasport 250 Explorer 1999 25' Aquasport walk around powered with twin 150hp Johnson Ocean Runner outboards with low hours. 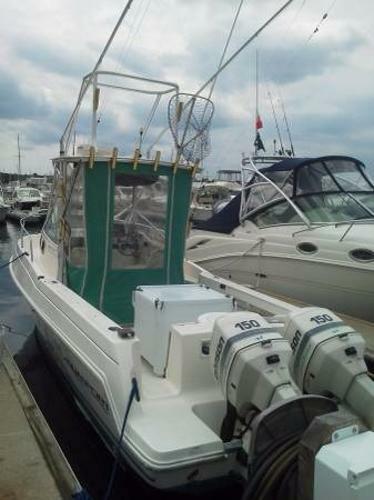 Custom tuna tower, rocket launchers, outriggers, full enclosed w/t-top, fish box, Raymarine C80 plotter, radar, and sounder, depth finder, stereo, VHF radio, shore power, battery charger, deck wash. Shows nice, great fishing machine. Included is a 2008 Tandem Trailer. 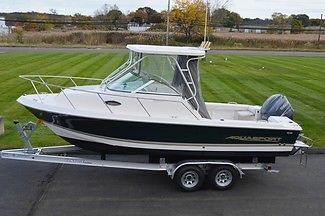 2004 Aquasport Walkaround 225 Explorer, 2004 Aquasport 225 Explorer Walk around F 225 four stroke Loaded with current electronics including Radar 2011 Trailer included 2004 Aquasport 225 Explorer w/ Yamaha 225 HP 4-Stroke (Only 289 Hours!) 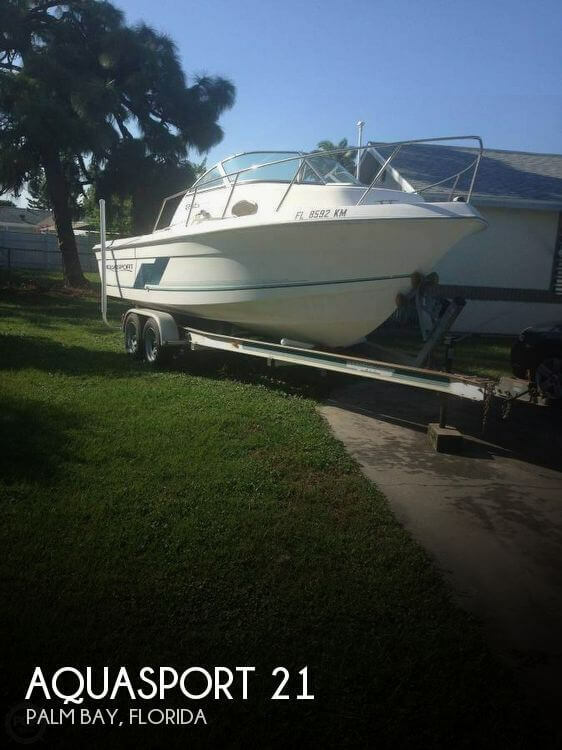 - Hardtop w/ RADAR - LOADED - Aluminum Trailer Included & Just Serviced by Norfolk Marine! Reduced Custom Electronics Suite installed in 2011 include: Raymarine E120W Hybrid Touch w/ US Charts, Raymarine GPS, Raymarine RD424D 4kw 24" Digital Raydome, Bronze Thru-Hull Transducer, Additional Transom Mount Speed & Temp Sensor ($9,274.99 invoice total on this electronics package!). Custom Stereo System installed in 2011 include: JL Audio M600 6 channel amp, Alpine CDA-118M CD Player, Alphine Wireless Remote, Alpine 600W Marine Amp, JL Audio MX Series Speakers, JL Audio 7.7" Marine Co-Axles (Sport/White), & Alpine SWR-M100 10" Marine Subwoofer 300W RMS ($4,145.93 invoice total on this electronics package!). Trailer is a 2012 Tandem Axle Road King Aluminum Bunk Trailer w/ Disc Brakes & Trailer Load Guides. Trailer is in Excellent Condition as well. One owner boat has traded in on a larger boat here at Norfolk Marine. For more details call us today w/ questions or to schedule an appointment! Owner also has fishing equipment available for sale with the boat, be sure to ask your salesman if interested. Disclaimer: Centerville Marina offers the details of this vessel in good faith but cannot guarantee or warrant the accuracy of this information nor warrant the condition of the vessel. A buyer should instruct his agents, or his surveyors, to investigate such details as the buyer desires validated. This vessel is offered subject to prior sale, price change, or withdrawal without notice. - 2004 Aquasport 225 Explorer w/ Yamaha 225 HP 4-Stroke (Only 289 Hours!) - Hardtop w/ RADAR - LOADED - Aluminum Trailer Included! 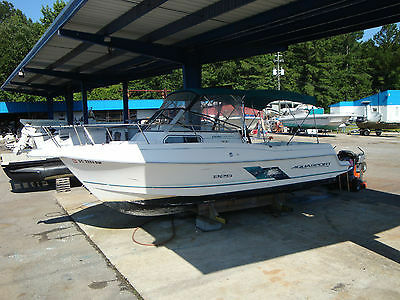 2005 Aquasport 215 Explorer *****TURN KEY & READY TO GO***** This boat has only had ONE OWNER!! 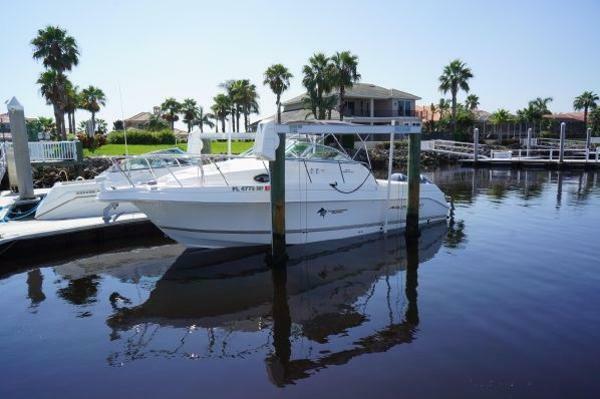 Are you looking for a clean boat that is turn key and ready to go? This is the boat for you. 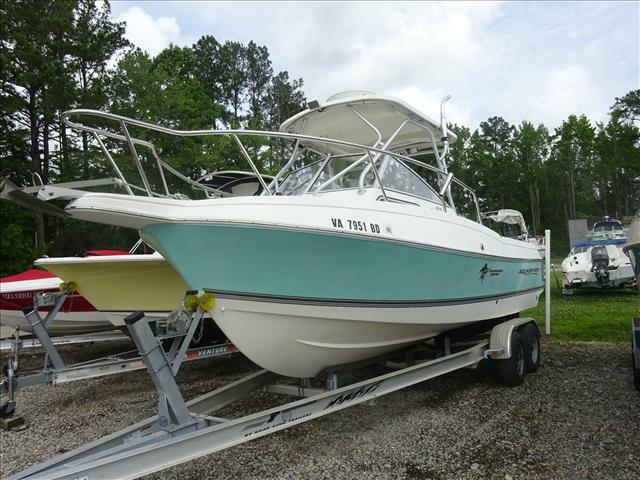 This well maintained walk-around is laid out perfect for a family/ fishing style boat. This boat has two swivel helm seats and two aft jump seats. Cabin has seating/ sleeping arrangements and also includes a nifty slide-away head. This boat also includes a 2008 LOAD RITE TRAILER that is in GREAT CONDITION! !